That's right, I saved the crème de la crème for last! I am a Ravenclaw, like my father before me. I honestly cannot recall ever wanting to be anything else, having identified as a Ravenclaw for as long as I can remember. You can imagine my relief when I was part of the Pottermore beta testing (oh yes I was) and had my lifelong understanding confirmed: I am wholeheartedly, without a doubt, a Ravenclaw. Contrary to popular belief, our mascot is an eagle, not a raven. The eagle is a symbol of strength, immortality and closely linked to gods Zeus and Odin. As an American witch, I can't help but feel right at home with a mascot matching the United States' national animal. I challenge you to find a cooler bird out there! Luna Lovegood, arguably the most lovable character to ever exist, is of course a Ravenclaw. Cho Chang, another Ravenclaw, showed that being analytical doesn't mean that you can't show emotion too. Garrick Ollivander, considered to be the world's best wandmaker, was a Ravenclaw as well. He used both his creativity and his knowledge to be successful in wandlore. Professor Flitwick, head of Ravenclaw house, was a champion duelist. There is a long line of talented Ravenclaws in all areas of the wizarding world. We aren't without flaw, however. Professor Quirrell and Professor Lockhart were both Ravenclaws. Quirrell was tempted by the allure of dark magic. Lockhart let his pride get the best of him. Ravenclaws crave all knowledge, even the knowledge of evil. I feel a little weird showing house pride as a Ravenclaw sometimes. I'm not trying to proclaim that I'm smarter than you or to rub my intelligence in others' faces, but if Gryffindors can be proud of their courage why can't I be proud of my wisdom? Wit beyond measure is man's greatest treasure, after all. 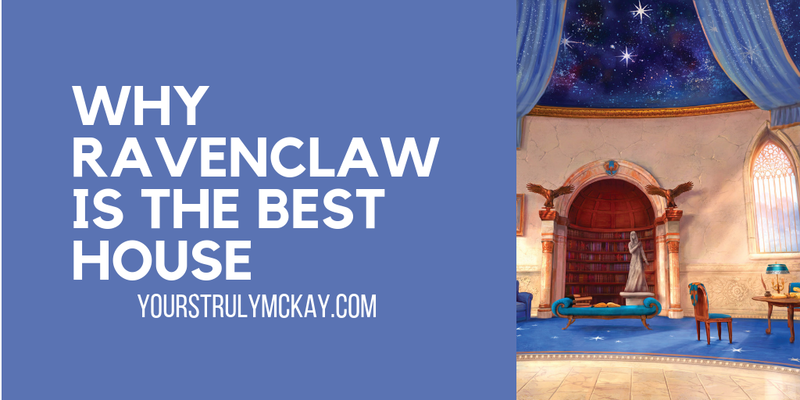 And that's something that I admire about Ravenclaw - an entire house full of people who value education, learning, and knowledge. They are constantly striving to be better and to learn more! What more can you hope for in the people that you surround yourself with? Trust me, I don't claim that I am a genius by any means. But I love to learn - in any form, not just with a book! I love working in an educational environment, and one might say that I know my library a little too well. 3 times out of 10 I'd choose non-fiction over fiction (the other 7 times being each of the Harry Potter books). I love to communicate through the written word, whether on this blog, through owl post, or via SMS text. Ravenclaws are creative and independent. They can find innovative solutions to problems and value logic. They observe and take in all that they see. Admittedly, the coolest part about Ravenclaw is the entrance to their common room: you have to answer a riddle to get in. What's most amazing is that this has been fool-proof against all non-Ravenclaws since...ever. I'm not sure how nobody wanting to break into Ravenclaw Tower has been successful, but it's a happy thought that that's all of the protection that they need. "...I think the answer is that a circle has no beginning." Plus, who doesn't look good in blue? Nobody, I reckon.